Yewande is Yoruba from Ogun State and her husband, George is Efik from Cross River state, although he's from an inter-ethnic household as his mum is from Delta state. I'm so excited to share her love story and experience. From the one thing she'd strike out from her husband's culture, to how she's pretty much an expert at Efik dishes! We met while at Uni for a master's degree at Warwick Business School. It started out as nothing serious but about one year in, I knew he was different and I figured he would become my lifetime partner. We dated for 4 years before he proposed. It was private and special in my bedroom just like I had always wanted because I do not fancy public proposals. Any specific dating challenges related to cultural differences? We faced challenges that were not specific to tribe at all. We had fights that every normal couple go through in the teething phase - getting to understand each other's personalty, boundaries, values etc. Did you intentionally seek to marry across board or was this just pure co-incidence? Even though I am Yoruba, through out my life, I have cultivated deep friendships with people of other tribes. I am not precious about tribe at all and I knew that there was a very high possibility that I would marry a non-Yoruba man going by the trend of my friendships. I did not intentionally seek out a non-Yoruba husband but this happened and it was very much in-line with my expectations. His side was fine, unless of course he was protecting me from knowing the details - haha. My family however, like your average family were not enthused by the fact that I was dating someone who was not Yoruba. They thought it was a phase while I was away at Uni that would pass when I moved back home but alas it wasn't! Mr Thorpe and I continued to wax stronger and stronger till my family could no longer ignore. My parents shared their reservations which were not necessarily from a tribalistic view point but more from a culture compatibility standpoint. They were scared that it would be too difficult for me to navigate but as they got to know my husband and his family for the amazing people that they are, they totally warmed up and became besties with my in-laws! The wedding planing was a little difficult. Different tribes have different practices and beliefs that may be foreign to others so it was a constant game of listening and reaching middle ground at all times. At the end of the day everyone was happy and each culture was duly represented. We wore outfits from both tribes and even had Efik dancers entertain at the traditional ceremony! It was a beautiful display of Nigerian culture. One aspect of your spouses' culture you have come to appreciate? Most intriguing things about your partner's culture? One thing you'd strike out if you had the chance? I am not sure about traditional Efiks but like me, my husband is also not precious about his tribe. He does not have any strong beliefs that are based on tribe so we have not had any such issues. Being from an inter-ethnic family as well means his parents are also accepting when it comes to culture and beliefs. However, there was one thing I wish I could strike out! At the end of the wedding ceremony, there is usually some prayers said for the couple by family members. This is traditionally done in the groom's home but Yoruba families have become very flexible in recent times so prayers are just said in the wedding hall and the couple can get right back to their partying. My in-laws let me know that in their culture, prayers have to be said at home as well as a washing of feet mini ceremony that could not be done in a hall. So all my plans to get lit at our afterparty were cancelled! We had to leave the venue at around 9 when the groove was just starting, sigh. I made my peace with it several months in advance though so I had maximum fun until we had to leave. 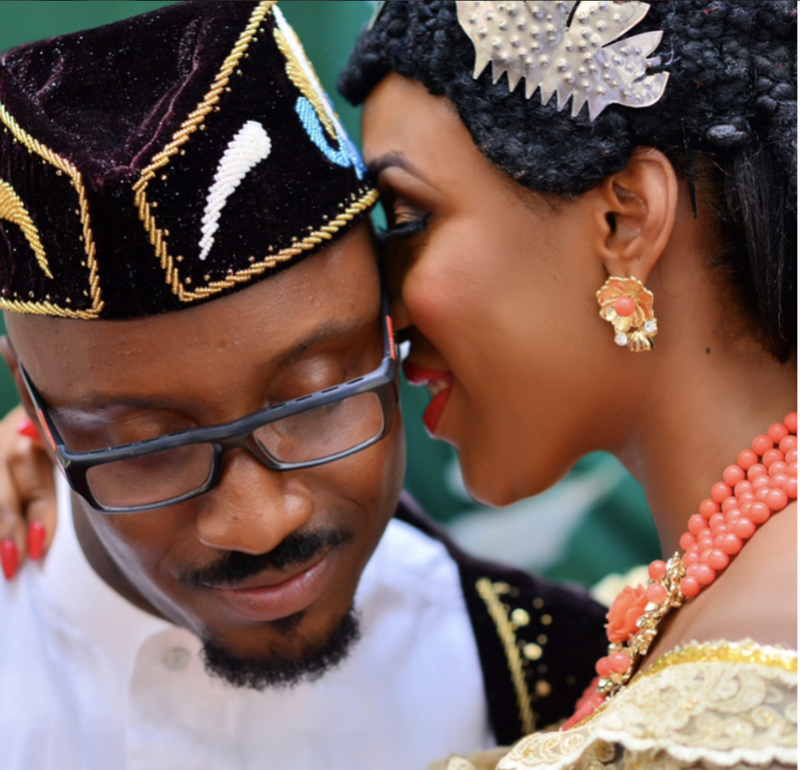 So my husband is Efik and Itsekiri - the Efik side of things I think I have on lockdown. I actually got a cooking instructor before the wedding -nan older woman from Calabar. She taught me how to throw down - Edikaikong, Afang and Afia Efere. Ekpangkukwo is the only thing I haven't learnt yet because even she was like "Uhm, that dish is a labour of love and only made for really special occasions". The Itsekiri dishes though, like Banga, Owo soups with starch, I have neither learnt nor even like the taste! My husband does understand Yoruba to a certain extent because he grew up in Lagos. I on the other hand, I'm still battling with learning how to speak my Yoruba, and my husband is terrible at speaking his local language! With the kids therefore how they will learn the language is the main issue here. Hopefully though, they will get to spend a lot of time with both grandparents to get fully immersed in both cultures and language. For their names, we'd go with English first names, to keep the peace - Lol! What has been the difficult/ most challenging aspect of being in an Inter-Ethnic Marriage? My Yoruba people are going to come for me because of this one but I gotta keep it 100. I think that when you are a Yoruba woman marrying in to another tribe, there aren't that many issues that are culture specific, from my experience at least. However, if you are a non-Yoruba female marrying in to a Yoruba family, it can be tough because Yorubas have strong values around respect, inlaws, elders etc that can seem way too much with people of other tribes. Even I who is Yoruba find it a bit too much sometimes. Best part of being in an Inter-Ethnic Marriage? I think it gives you a much broader outlook to life, makes you more tolerant and appreciative of other cultures and way of life. Top three marriage advice for new couples - inter-ethnic or not. Have fun! No one ever says that... you should have fun and enjoy your marriage. A great marriage is awesome! Make effort - don't let familiarity or 'see finish' enter the matter. Keep up your slay, wear cute night ware/pyjamas, buy amazing gifts, plan fun date nights. Always be on a mission to impress your partner. And it should go both ways! Free your mind people. Being from the same tribe never guaranteed anyone a happy and successful marriage. Your focus should be on the person and the family. I had a good laugh at the one thing she'd strike out from the Efik culture! I wonder if it was possible to go home, wash the feet and say the prayers and then head back to the party! And how impressive is the fact that she got an older more experienced woman to teach her how to cook the Efik dishes! And her point about not getting too familiar is key. Pretty much what we talked about last week - Comfort Zones & Familiarity in Relationships - How Far is Too Far? Finally, I'm wondering if it's indeed easier for a Yoruba female to marry a non yoruba than for a non-Yoruba female to marry into a Yoruba household. I think it all comes down to tolerance and understanding. What's your take? ppS: Catch up on other Nigerian Inter-Ethnic Stories here. I'm also considering extending it to marriages of Nigerians to non-Nigerians and other races in general. Let me know your thoughts!